OLT-55 Intelligent Optical Loss Tester is an all-in-one loss tester integrated with Stabilized Laser Source, Optical Power Meter, Optical Loss Tester, ORL Tester and Length Testing functions. 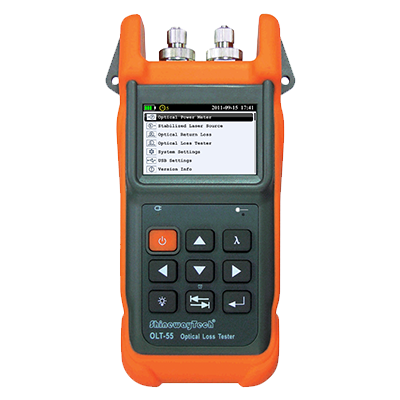 It can perform automatic bidirectional loss test on single fiber with Pass/Fail assessment. With rich functions, flexible configuration and excellent user friendly design, OLT-55 is the ideal optical loss tester to completely evaluate the optical fiber link condition in FTTx, LAN and CATV network. © 2019 Bitrate (PTY) Ltd, All Rights Reserved.